Reuters cites ECB sources as saying the proposal was discussed this week – and ruled out as being illegal under EU treaties. 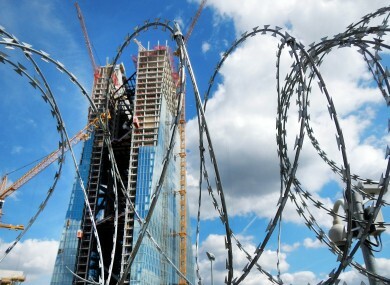 The site of the ECB's future new headquarters in Frankfurt, seen guarded by barbed wire. THE EUROPEAN CENTRAL Bank is reported to have ruled out the prospect of allowing Ireland to issue a long-term government bond to replace the promissory notes given to the former Anglo Irish Bank. Reuters cites sources at the Frankfurt-based ECB who said the proposal was discussed at a meeting of the bank’s governing council this week, but deemed to be in breach of the European Union’s founding treaties. Article 123 of the Treaty on the Functioning of the European Union prohibits the ECB or national central banks from offering credit facilities for “public undertakings of Member States” – with the bank’s governors reportedly agreeing that this prohibits Ireland from replacing the promissory note with a bond. Promissory notes, a form of IOU, were issued to the former Anglo Irish Bank and Irish Nationwide before the two bodies were merged into the Irish Bank Resolution Corporation. The notes – worth a total of €30.6 billion – are deposited with the Central Bank of Ireland, which in turn allows the now-IBRC to borrow cash equivalent to those amounts. IBRC, which is fully owned by the government, must make an annual repayment of €3.06 billion each March. Because the money repaid to the Central Bank is essentially destroyed and taken out of circulation, many economists have argued that IBRC should simply default on the repayments – a prospect the government has ruled out, seeing it as tantamount to a sovereign default. Earlier this month several Irish ministers said they were confident that a deal could be reached to avoid the next €3.06 billion repayment, due in nine weeks’ time. Only last Sunday, Taoiseach Enda Kenny told RTÉ he foresaw the promissory note being restructured “from a serious overdraft to a long-term, low-interest mortgage” – an arrangement that would probably have meant the issue of a long-term government bond to replace the promissory note. Separately, a spokesman for the Department of Finance played down newspaper reports that a secondary IMF bailout fund could be made available in order to assist Ireland if it was unable to gain full, long-term access to bond markets at the end of the current deal. Email “Report: ECB rules out long-term bond to replace promissory note”. Feedback on “Report: ECB rules out long-term bond to replace promissory note”.